Today's recipe comes two for the price of one. Number One: How to cook green beans in the microwave. How did I miss cooking green beans in the microwave? (Perhaps because I didn't have one for so many years? Perhaps because the one in the kitchen is serially referred to as the Popcorn Maker and the Butter Melter and the Water Boiler?) 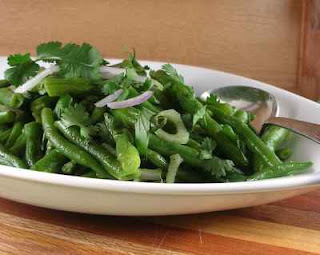 Call me hooked, these fresh green beans cooked in the microwave were great. Number Two: A new flavor profile, thanks to my new favorite cookbook, Rick Bayless' Mexican Everyday . The beans are the cookbook's maiden recipe but I've been pouring through the pages, bookmarking recipes, underlining ingredients, strategizing what to make when. Once again, call me hooked. This is home cooking, Mexican style. The ingredients are (mostly) familiar and (mostly) available. And it doesn't endorse cooking by prescription but by taste. Every single recipe includes adaptations and embellishments. The dressing is made from only lime juice, cilantro and tomatilla salsa. Rick's recipe called for 3/4 cup of oil, I used 1/4 cup and would even consider none at all. For the tomatillo salsa, I checked the 'Mexican' shelves at the grocery (for St. Louisans, Dierberg's in Rock Hill) to find 20 selections of tomato salsa, mostly priced $4 - $5. But hidden near the end was a seven-ounce can of something called 'green Mexican salsa' from La Costena. I checked the label, the first ingredient of seven (and no chemical names) ingredients was tomatillo. It was $.89. Sold. The cookbook suggests this as a room temperature salad. I served it as a hot side dish. You won't go wrong, either way. A YEAR AGO Pride of Erin Soup, "Ah, so wholesome, so so delicious!" I'm not the first to rave about Rick Bayless' Mexican Everyday . See what others say about the cookbook's recipes! Mix ingredients in blender. Makes about 2/3 cup (so plenty for another time). Place beans and a tablespoon of water in a microwave dish. Cover with plastic wrap, pierce in two or three places to allow air to escape. Cook til done (Rick says 3 minutes, my mike took 6, this will vary all over depending on the mike's power.) If needed, drain. Toss together dressing, beans and onion. Taste and season to taste. Garnish with cilantro. I love tomatillas, and am guessing I'd love this. My brother used to see Rick Bayless at the gym all the time when he lived in Chicago! How about if we make sure we eat at both his restaurants when we go to Blogher! I have that cookbook sitting on my shelf - maybe it's time to dust it off. I will try this and let you know how it went.